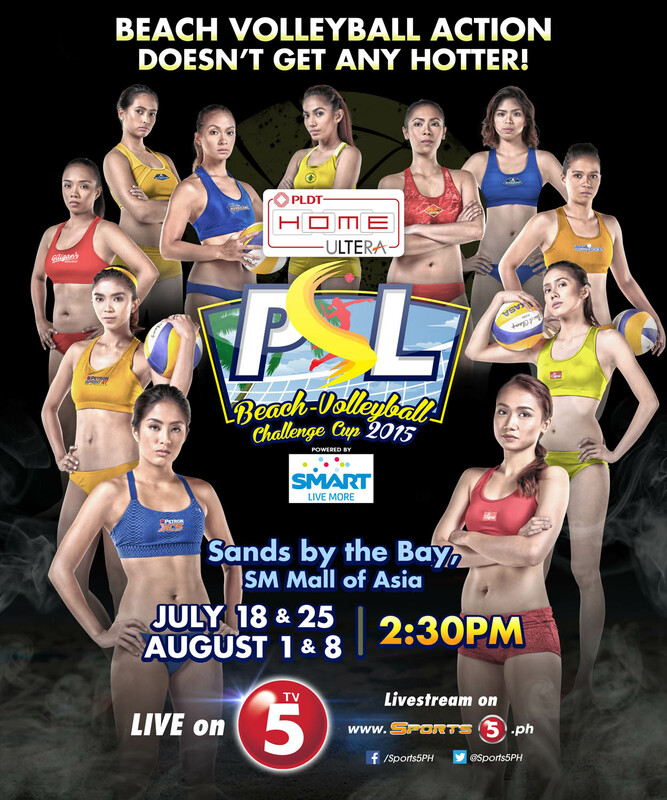 The summer season may have come and gone, but expect the temperatures to once again rise to record levels as some of the hottest, most athletic and most popular volleyball players take center stage anew, this time on an even more festive and competitive atmosphere via the inaugural PLDT HOME ULTERA PSL Beach Volleyball Challenge Cup 2015, Powered by Smart, Live More! Volleyball fans and aficionados can expect to be served with high-caliber action in the maiden voyage of the PSL Beach Volleyball Challenge Cup every week, where 13 women’s pairs will be competing in the outdoor sand courts of Sands by the Bay in Mall of Asia, Pasay City, beginning this Saturday, July 18. The first-ever staging of this volleyball tournament organized by the Philippine Super Liga will be bannered by marquee volleyball stars, with the likes of tv personality and hard court head turner Gretchen Ho, PSL Ambassador Charlene Cruz, former Ateneo stalwarts Charo Soriano and Fille Cayetano, De La Salle University ace spiker Wensh Tiu, and Filipino-American Alexa Micek all set to take the sand courts by storm. And with the sport of volleyball unprecedentedly growing in popularity in the country, Philippine Super Liga has once again partnered with TV5, the Philippines’ official Olympic broadcaster, who will be on deck to exclusively air select matches live from 2:30PM – 4:30PM. 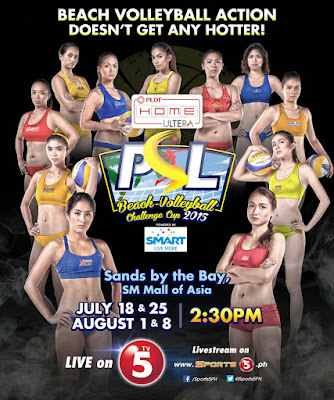 The live and exclusive television coverage of the PLDT Home Ultera PSL Beach Volleyball Challenge Cup 2015, Powered by Smart, Live More! will kick-off this Saturday (July 18) and every Saturday thereafter for the next 3 weeks (July 25, August 1 & 8) at 2:30PM, with free livestreaming on www.Sports5.ph.